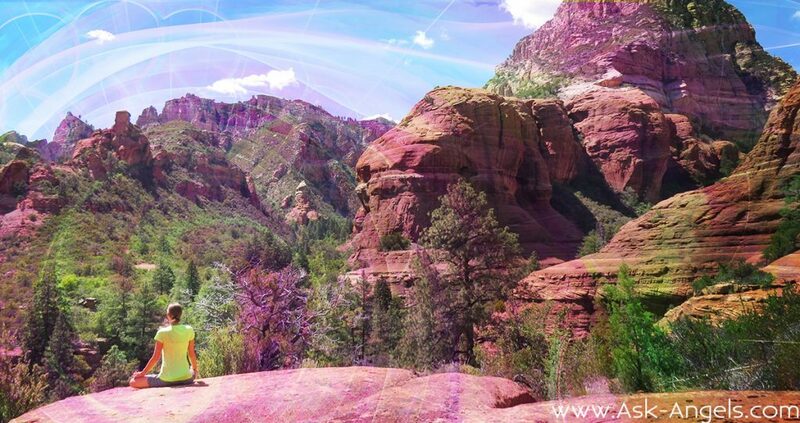 For the past couple of months I've been living in Sedona Arizona… If you aren't familiar with Sedona, there is a incredible vortex energy here which has made it quite the popular spiritual travel destination. And for a good reason, it's truly a breathtakingly beautiful place, the energy here is lovely, and the presence of Divine Light and Awakened Earth Energy really is strong. These are the vortexes, and I've been loving hiking to and meditating at both the many known and relatively unknown vortex sites in Sedona. But the thing is, you don't have to travel to Sedona, or to the many other well known Vortex locations on the planet to tune into the healing, inspiring and rejuvenating Vortex light. Meanwhile I'm blissing out on the Divine Light and Earth Energy of the Vortex light spiraling around us. This doesn't mean I'm special or anything… Because anyone can tune into Vortex light. And that's just it… Wherever you are, you can tune into Vortex energy. So, in my new YouTube video, I share with you exactly how to tune into vortex energy right where you are! You'll get to experience vortex energy right now… Plus you'll know just what to do to tune in if you do find yourself in Sedona, at Mount Shasta, hiking Machu Picchu or at one of the many other vortex locations around the planet. Get The New Vortex of Love and Light Meditation with Metatron here! I am SO called to Sedona. NOTHING fills my body with Joy more than the possibility of being there. But I was also told by a Psychic / Channel / Healer living there how Sedona can “chew you up and spit you out” if your own Energy isn’t ready for that strength of Sedona Energy yet. This person told me how this possible negative experience for people there “is the joke around Sedona!” I replied “They don’t tell you that on the vacation websites!” I believe this person was speaking of ALL the Energy of Sedona NOT ONLY the Vortex Sites there. THANKS SO VERY MUCH For Answering If / When You Can. Hi Melanie, stealing some lunch time, may I just gratitude for what you are doing for people at large, as a missionary..go on why not set some kind of Angelic circles every where in the world, where we all can contribute at all levels to keep this world under Christ and Archangels ‘ control. I used to live in Flagstaff for many years. I am very familiar with Sedona, Oak Creek Canyon and its energy. My sister and I were hiking there one day and we came across a cave. It was a mountain lion den. So, I just wanted to say, although you are not in the middle of the thick woods, there are certain things you need to know. Rattle Snakes like to warm up in the morning by sunbathing on the warm rocks. Although you think you may be able to see what is all around you, there are still many wild animals in the area. Mountain Lions, scorpions, snakes, and wild boars, also known as havalinas. So use all of your senses, sounds and smells in particular. Snakes smell like burning rubber. Mountain lion smells like huge cat. The Scorpioms are pretty big and really do not bother you unless they have crawled into your sleeping bag. Enjoy! Thanks Molly! I’ve seen several snakes so far… But there have been mountain lion sightings in the area, and actually a Bear sighting in Boynton Canyon too! Sedona will get the energy? Thank you so much for that. Really special. Appreciate you sharing with us. I hope you had a wonderful hike.